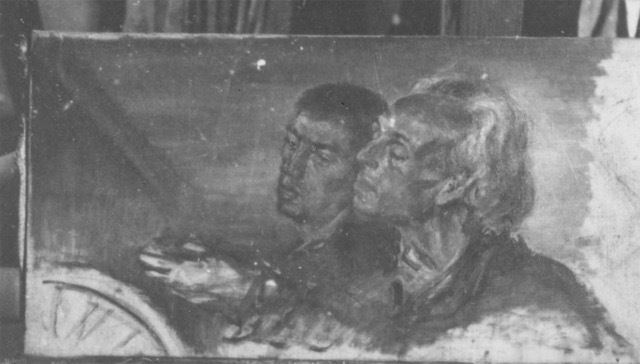 Photograph of a lost unfinished painting of two men facing to the left. The white-haired man with his eyes closed is possibly the artist; the other man remains unknown. Łódź State Archives, signature 40_1381_8; copy in Yad Vashem Photo Archives, 7950/33a, has a Yiddish text on reverse (undeciphered). Another variation at Yad Vashem is 7317/3814. Yad Vashem items were gifts of Tobias Rozynès, Lyon, via Gérard Mayer.